Rugby Star Slot offers casino players their own game for real money. Like the game itself, Rugby Star is explosive in parts. Lining out the free spins, passing the Wilds and drop kicking big wins up the field for the boldest of players to chase. And all from just 50p per spin. There aren’t too many rugby video slots kicking around, so when Microgaming announced plans to expand their sports star series of slots (namely football star and cricket star), we got rather curious. Boasting 5-reels, 243 pay lines and a free spins bonus round, the Rugby Star Slot fills the boots nicely of another much-needed video slot for the vacant sports slot genre. The spin price tag is big, but for those real money slots players opting in for 50p per spin minimum bet. Rugby Star offers greater wins than previous Microgaming sports slots with more power on the payout front. It’s mobile responsive too, with the Rugby Star mobile slot variant also getting on the pitch. It’s not a total crowd-pleaser, and it’s certainly not the man of the match, but Rugby Star tackles the basics of video slot gameplay well. So who’s going to like Rugby Star? It isn’t just for die-hard rugby fans or players with a passion for sports themed video slots. The basic design tells us that. So to prove a point, Slotsquad’s not so active or knowledgeable about Rugby Adam Dale gave it a spin. We also used the iPad 6 to try out the Rugby Star mobile slot on the smaller screen. In terms of graphics, the effectiveness of cartoon visuals works a treat alongside the smooth animation engine of Microgaming with only the sound letting the side down. Gameplay is also good, although some real money slots players will find the match ticket of 50p (lowest price per spin) high. Yet don’t forget the returns are potentially better. Playability positives include a free spins round that offers up to 25 free spins, rolling reels (always a winner) and Wild pass running within the Rugby Star base game. It’s not bad, keeps you interested. On the reels there’s no question of the sports theme that’s involved. It’s a nice looking game. Designed comfortably within a sports stadium that utilises some clever symbol illustrations for the 5-reel framework. Looking more closely, you’ve got lots of men running around holding the ball in different positions, and that’s fine, what did you expect? 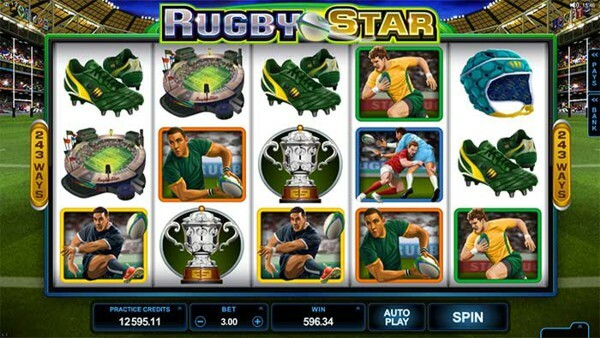 The Rugby Star Slot (both mobile and desktop) offers low-paying symbols (Rugby Players) increasing in value to medium-paying symbols (Rugby Equipment). 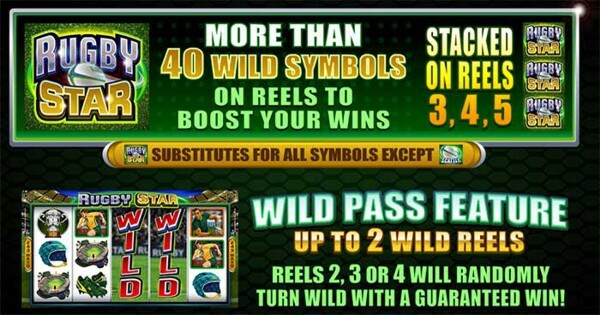 Higher-paying symbols include the match trophy and valuable bonus icons such as the free spins goal post, the Wild and the Rugby Ball Scatter. The latter three are the symbols you want to find! Both Rugby Star mobile slot and the Rugby Star online slot variant share identical integrated features, so mobile slots players can get in on the action too, almost anywhere. One of our favorite features is the Rugby Star Rolling Reels aspect. This symbol replacement mechanism can be quite lucrative for big wins or even extended wins. Rolling Reels moves standard winning up a gear by increasing in-play payout performance. For example: get a winning line and those winning symbols will disappear, yet instead of the game moving on, the symbols above will fall to fill the gaps. This process will continue until the Rugby Star Slot fails to find a winning combination, after which the reels will then begin to spin again. Rugby Star features Scatters too, designated by the Rugby Ball Symbol and responsible for activating the free spins bonus round. The number of Scatters on the reels will dictate the number of free spins offered with a wide range available. Three Scatters award 15 free spins, four Scatters 20 free spins and five Scatters the maximum at 25 free spins. What’s also exciting about this feature is Microgaming’s decision to maintain the Rolling Reels Rules for this round but with an additional multiplication process attributed to wins gained. In English please, it’s called a multiplier streak and for winning streaks (that’s 2 or more consecutive winning spins) players can get a multiplier of up to 10x. If it’s Wilds you’re after, they’re in the line out too. Wilds have long been one of Microgaming’s strong points in how the developer uses them and Rugby Star is no exception, again polishing the technology seen in the earlier Football Star. Here, you can witness one of two Wild situations, a randomly triggered “Wild Pass” feature within the base game along with the proven “Stacked Wild” model. Like other slots, in Rugby Star, Wilds are used for symbol substitution to gain possibly win lines in favor of the player. So it’s good to see them off the bench and involved in the game. While the demo mode offers free spins on Rugby Star, it’s not until players opt for real money play that those features above start to matter. It’s a 5 x 3 grid overlaying a 243 pay line model. All lines are continually in play; hence you won’t find a 1p spin option in this game. You get what you pay for. And here that’s lots of coverage on the reels from 50p to £50 per spin as a maximum bet. The jackpot for Rugby Star is 250 coins with a maximum capacity offering £120,000, working in conjunction with a calculated payout rate of 94.4% RTP. Not the cheapest video slot to spin granted, but with lots of betting coverage and features to keep the game moving. Rugby Star offers the sports slot genre a solid prop to help tackle bedroom or bus stop boredom. Available for mobile or desktop, the Rugby Star Slot is about to become the focus of the online casino industry, we just hope it’s still around following the Rugby World Cup Final. Now then, will your spins get you that big conversion. Crouch, bind, set and spin!